Description: Creates a unique gridded timeline showing intensity by day of matching records - Y axis is year and X axis is day, making anniversary behavior instantly visible. Acknowledgements: Makes use of Google BigQuery. The EVENT Timeline Visualizer allows you to create a unique gridded timeline visualization from the GDELT Event Database to understand temporal patterns in records matching your search criteria. In this visualization the X axis represents each day of the year from January 1 to December 31, while the Y axis represents each year of the data (currently this goes back to January 1, 1979 for event data). Thus, rows represent years and columns represent a given day across years. At each grid cell a semi-transparent dot is displayed, sized based on the percentage of all event records from that date that matched your search criteria (thus these timelines are normalized against GDELT's exponential growth over time). The compact nature of this visualization allows you to spot temporal patterns at the daily level, whereas with a traditional barchart or line graph timeline, the individual bars or line points would be too small with this many points to see anything. 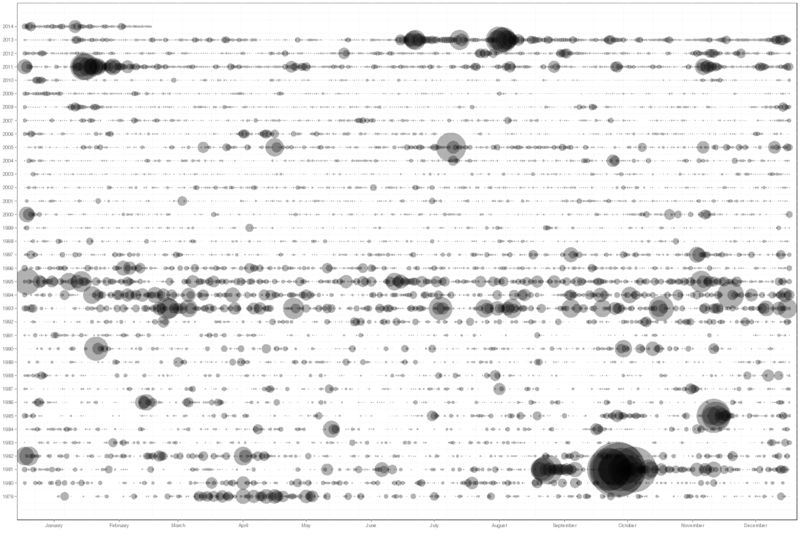 In addition, the unique gridded nature of this visualization allows you to rapidly spot "anniversary recurrances" in which surges of certain activities or discussion occur each year around a specific date that is an anniversary of a major event in that country's history. No programming or technical skills are required to use this visualization - you simply specify a set of criteria for the event type and actors involved, along with an optional date range, and the system will automatically search the entire GDELT Event Database for all matching entries and compile the final timeline. Your results will be emailed to you when complete, usually within 10 minutes, depending on server load and the time it takes to perform the necessary calculations. Selecting "Nigeria" as the "Event Location", "Material Conflict" as the "Event Quad Class", and "Civilian" as the "Recipient/Victim (Actor2) Type" will generate a timeline of attacks and other conflict against civilians in Nigeria. Timeline Visualization Generates a static gridded timeline visualization as a .PNG image. .CSV File This outputs a .CSV file containing a normalized intensity of matching event records per day. This is normalized by the total volume of all event records for that day. The spreadsheet has three columns - the first is the year, the second is the month and day, and the third is the percent of all event records from that day that matched your search criteria (thus normalizing for GDELT's growth over time).